How comfortable are you talking about salaries with coworkers? 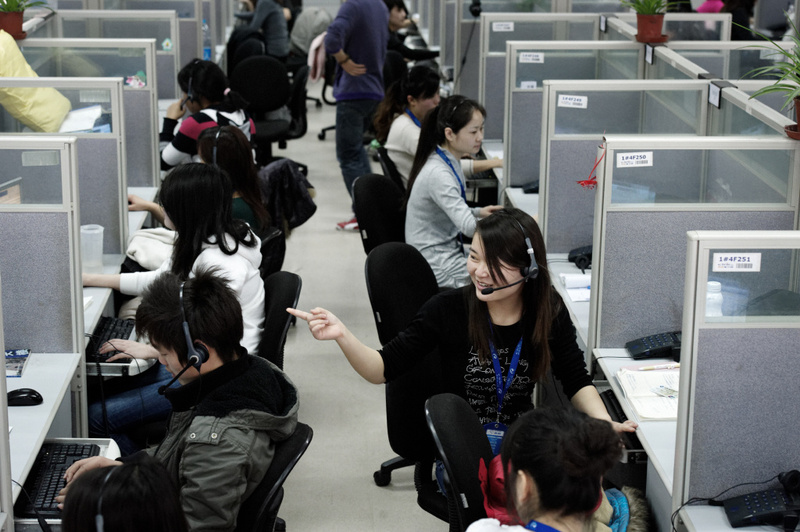 This photo taken on March 9, 2011 shows employees at China-based company Ctrip in the call center of their headquarters in Shanghai. The one-stop China travel service Ctrip.com specializes in discount hotel reservations, cheap airline tickets and package tours. The Senate is expected to vote on the Paycheck Fairness Act, which aims to eliminate the wage gap between men and women. Similar versions of the bill passed by the Senate had been killed before by House Republicans. One provision of the law would ban companies from retaliating against workers who talk about their pay. Federal labor law already makes company retaliation illegal, but experts say a lot of companies still prohibit employees from doing so. Some human resources professionals worry that too much pay transparency would lead to resentment and low morale among workers, but advocates say disclosure is the only way to ensure pay equity. Have you ever talked about how much you make with your coworkers? Stephanie Thomas, Research Associate with the Institute for Compensation Studies and a lecturer with the Department of Economics at Cornell University. Earthquake insurance: Expensive but worth the cost? Will the Supreme Court’s McCutcheon ruling be a game changer for the 2014 Midterms? How do people strike up conversations based on geography?